Hey Tara, could you introduce yourself for those who haven't heard of you? I’m an aspiring sports photographer currently going into my 3rd and final year of my degree at UCA, Farnham. I’ve been interested in photography since I was a child - I’d always be the one taking pictures on family holidays when I was younger. I got more serious about photography when I got my first DSLR camera for Christmas about five years ago. As a favour, I did the photography for a friends netball match a few years ago. I loved the fast pace and challenge of keeping up with the game, so since then I never really looked back. How did you first get into football, and what made you start your photography series? I was born in Croydon, and both of my parents have supported Crystal Palace since they were children, so Palace is in my blood. I started my Twelfth Man series, a series capturing the matchday emotions of Palace fans, in June this year because I’ve always been fascinated by football fans, their rituals and their reactions during games. I’m doing it as part of my university course, and it’s still in the early stages - I’m playing around with what works and what doesn't. I’d really like to continue this project over the next few years, and document football fans from all over the country during the big games and the smaller games. I want to capture the emotions of fans and the match day traditions that lots of fans have from all leagues, from the Premier league to lower divisions. Each provide different fans but they all have their passion for football in common and that's what I love capturing the most, people's passion for the game. Has there been anyone who's influenced your project particularly? My main influence is Hy Money. 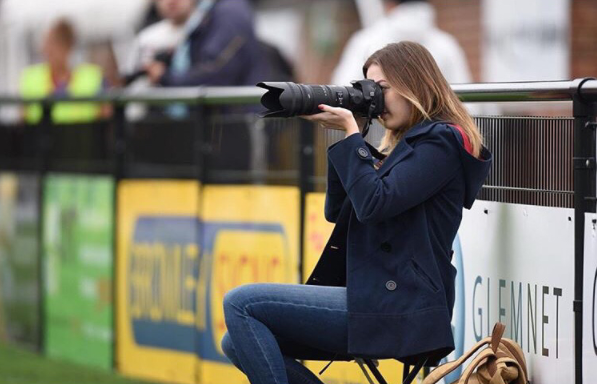 She is the first female sports photographer and she photographed Crystal Palace during the golden years of Mark Bright and Ian Wright. She had a tough ride getting into the industry but she didn't give up and her determination allows for other women like myself to get into sports photography too. She has always been happy to help and offer her advice to me over the last few years that I have been at university. Her book "Hy on Palace" is a huge inspiration for my series The Twelfth Man. What have you found the most challenging aspect of your project to be? Do you tend to get a good reaction from your subjects? People don't usually mind having their picture taken at the games - it’s definitely become more normal for there to be photographers outside the stadium taking pictures of the fans. You have to be respectful though - I get a few people who aren't very happy when they see my camera, so you just make sure you don’t photograph them. The most challenging thing about shooting Twelth Man is the rain! Trying to keep my camera dry on a shoot can be pretty difficult, but rain produces some beautiful shots when you can see the rain stood still in the image, so it's not all bad! Next I am going back to university in September to finish my degree! I am excited for my final year because I can really focus on my project and improve my skills. To see more from the Twelfth Man series and other sports photography, follow Tara over on Facebook or Instagram.